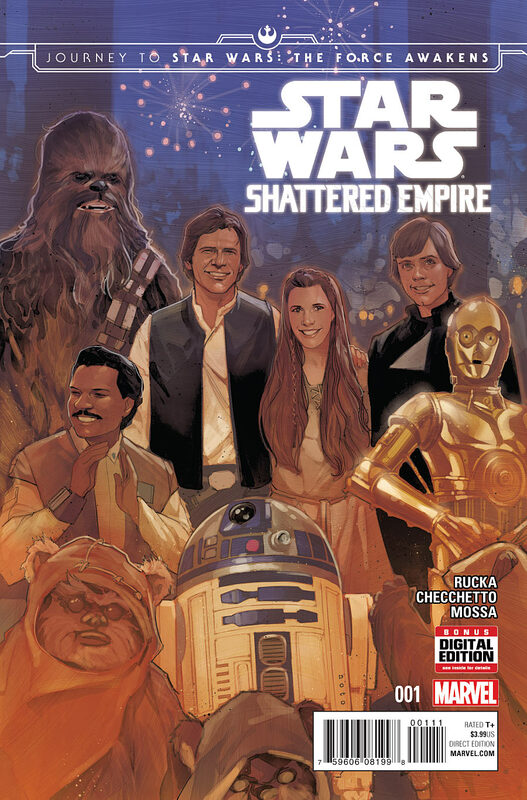 Matt C: No contest, top of the pile this Wednesday will be Star Wars: Shattered Empire - Journey To Force Awakens #1. 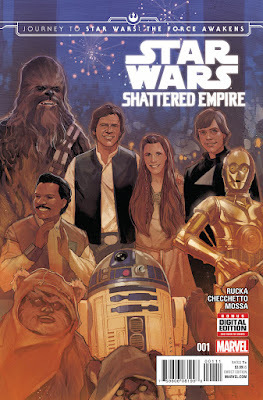 Yes, it's a bit of a mouthful (let's just call it Shattered Empire for short, shall we?) but it's also a first comic book taster of the period between Return Of The Jedi and The Force Awakens. It's been impossible for me not to get sucked up into the resurgence of all things Star Wars in the last 12 months or so, and with The Force Awakens just over 3 months away, we've still not quite seen things reach fever pitch. Shattered Empire focuses on the immediate aftermath of the Battle of Endor and how various factions of the Empire deal with the death of Emperor Palpatine. Did we really think they'd all give up they're helmets and blasters following the destruction of the second Death Star?? If you told me this pitch before I saw the credits and asked me who I thought would be great at dealing with political strife on an operatic - and personal - scale then I would have probably suggested either Jonathan Hickman or Greg Rucka, so it's great to know that Rucka - the man behind my firm favourite, Lazarus - is in the driving seat. Other highlights for me are new issues of Deadly Class and Outcast, and seeing Injection #5 reminds me that I need to catch up on those unread instalments pronto! Kenny J: As we get ever closer to the conclusion of Secret Wars and near the reboot of Marvel’s entire line, it's both exciting and a shame as some of the tie-ins to the main event are books I both enjoy and look forward to. For example, Kieron Gillen seems to be having so much fun on Siege, getting to revisit certain characters in a world pretty much devoid of continuity, it's nigh on impossible not to go along with the story, especially when it is full of such inventiveness: the Endless Summers, UNIT as an envoy of Ultron, actual mutated Ant-Men, to name but a few. Some things can’t last forever just like Bruce Wayne’s tenure as Batman. The last issue of the eponymous title was a tender look at the status quo of Gotham’s first son, Jim Gordon, and the mysterious Mr Bloom, a foreboding but welcome addition to the new robot Bat’s own rogue gallery. This book is fast closing in on fifty issues and I expect Scott Synder has a plan that reaches at least as far as Batman Vs Superman: Dawn of Justice and hopefully the return of Bruce as Batman.